I needed 3 hours to find out how, but it works on Sierra. You just need stuffit (for the .sit), then realize you need an emulator of old macs. Discover sheepshaver and not understand at all how it works. Read forum threads, search stuff, download stuff, try stuff, fail. Find out about "redundant robot sheepshaver", but then fail again. Read forum threads, search stuff, download stuff, try stuff, fail, cry a lot. Figure it out, then launch the emulator, not having a clue how to use the .toast file you have got. Use Disk Utility to create a DVD/CD master image of the toast file. Add this .cdr in the volumes of the virtual machine settings. Install and play the game. Yeah, when you know what to do, it is really simple. I have installed the game on sheepshaver and everything but they still tell me I have to use a Playdisc to play the game with SheepShaver. And the problem is, I can′t use the .toast of the playdisc on sheepshaver so I can′t access to the game, the campaigns and stuff, only to the multiplayer mode... :( how can I do that ? Installed everything on Sheepshaver with OS9, following LAERO′s steps. That part worked great. I then tried to run the game with play disk 1 loaded into the ′volumes′ menu of Sheepshaver. The game opened, and then about 2 seconds later, stopped on a black screen. I could still move around the familiar-looking HOMM ′spear cursor,′ but nothing loaded, so I couldn′t click on anything or get to the actual game menu. Has anyone else run into this issue and know how to troubleshoot it? As explained by LAERO, I have installed the game on the virtual machine OS9 with Sheepshaver. The trouble is that the installed version enable me only to access to multiplayer. When I launch the soft, a window tells me to introduce the play disc within the lector.. How do I bypass this? open install disk with stuffit 2010.
install the game, it will be located in your applications section. run heroes from the install directory in your applications folder. But when i try to install, the game said: "You can’t open the application “Install Heroes 3 Complete” because the Classic environment is no longer supported." It appears to me no one got answers to their questions in this comment field, but i′ll try anyway. Im also new to mac and i get som kind of error message when trying to extract the sit files. Living in japan causes the message to appear in Japanese and i don′t fully understand it but it has something to do with the folder, so i presume its the same problem others have had. Would really appreciate any help! When I download the file, all I get is an empty zipped file which I cannot extract. I think this problem is caused because this is a mac version... but the real problem is that this mac version is the ONLY version. I know beggars can′t be choosers, and also miracles never happen, but is there someone awesome, kind and epic enough to upload a PC version so PC gamers can enjoy this game too? Could really use a "Child′s Guide to running this on windows 7." I don′t think this can be played in SheepShaver. It requires Virtual Memory and SheepShaver doesn′t support it. The game crashes when you select New Game and I think that′s the reason why. 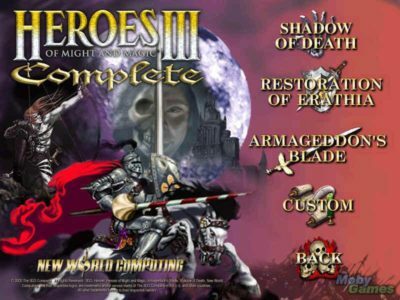 Heroes III is by far the best Heroes game. Heroes II was also good, but the combination of beautiful graphics (for the time it was made), wonderful creatures, and awesome in-castle music that Heroes III offers just can′t be beat. Nothing to date in this franchise even begins to compare. Installed the game on my emulator, but when I open it, it says I need the play disk. Anyone know what to do? I downloaded, open with Stuff to and also tried Unarchiver but when double click ′Install Heroes 3 complete′ I get the message – You can’t open the application “Install Heroes 3 Complete” because it may be damaged or incomplete. "You can’t open the application “Install Heroes 3 Complete” because it may be INCOMPLETE." Got the same comment, as Kai, but Rito Master 123 wrote "works", so how do I run it? i downloaded the file and extracted it, but it wont let me play the game, it says the file is incomplete or broken? I tried to download and run certain programs, but still gets only error messages that classic program is required. According to Google, it′s not possible for my MacBook to run it. Well, I′m one step closer – I unpacked two of the 4 files the install and the expansion – you need to use "unarchiver" – free in the app store. I′ll let you know if I make anymore progress. The other two have an error message – working on that. Im getting the same permission error, is this a problem with needing something like sheep shaver to open or am i wasting my time ? For PC version, try also addon Horn of the Abyss. Extra town and stuff. Installable over HoMM 3 complete. For Mac, try VCMI project to get extended versions. hey guys i′m new with mac… can i get some help? how do i open the 4 files? Correction, I managed to get the play disc open, however, the install disc and the updates will not open with stuffit expander. I downloaded the files but I have 4 files which I can open only on TextEdid… So I downloaded OpenEmu because I read it on the other comments but the game still doesn′t run… What can I do? Please help me!! GEORG, look at the Stuff It Expander temp files. Look at the log file of the program to find them. The extracted files are there, you just need to copy them. anybody coukd tell how to install it from the begginig of unziping the file to run the game? I′m really excited to have downloaded this, but when I load it in my mac emulator, it tells me it can′t find the play disk. What do I do? All i get is 4 sit files inside a folder, cant really do anything with them. Pls help, im starting to belive this is all a big scam.